With this test you can check your central vision at home. 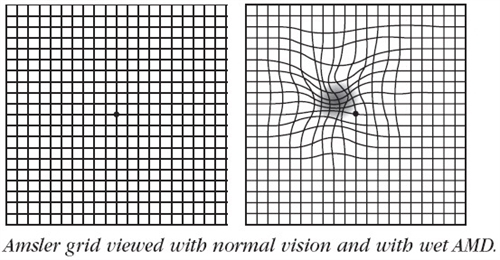 You should use the Amsler grid to test your central vision every day to detect any changes that may be caused by worsening age-related macular degeneration (AMD) or other macular disorders. 1. If you usually wear reading glasses, put them on to take this test. 2. Hold the Grid at a normal reading distance, about 12 – 14 inches away from your face. 3. Using only your right eye (left eye closed), look at the dot in the center of the grid. Make sure you can see the entired grid. 4. If any of the lines in the grid look distorted, blurry, or missing, write down what you see. 5. Repeat these steps with your left eye while your right eye is closed. If any of these changes are new, call the office at 860-749-1233. Make sure you cover one eye then focus on the dot in the center. Are there any missing areas or dark areas in the grid? Can you see all corners and sides of the grid? Don’t forget to test both eyes. VERY IMPORTANT: Report any irregularity the office immediately to prevent futher damage to macula or optic nerve head.